Russian designers create a helmet that they believe offers better navigation for motorcyclists than Google's wearable computer. At the inaugural Hardware Battlefield competition for newly created devices, LiveMap, a Russian start-up, presented a navigation helmet for motorcyclists, called Motohelmet. 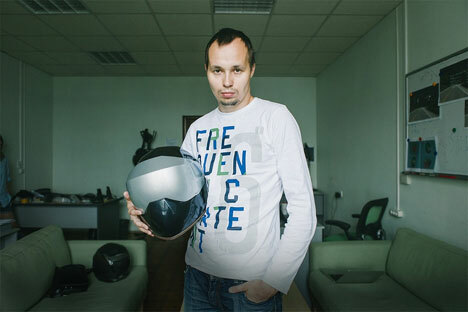 According LiveMap CEO Andrei Artishchev, the helmet allows the user to see the information on the navigation display without taking one's eye off the road. The designers of Motohelmet were inspired by helmets used by fighter pilots. Motohelmet will use the Android operating system, the NAVTEQ map database, and the Nuance voice control platform. The display will be safe for the eyes, with all lit elements hidden. The LiveMap team said they do not have any direct competitors, meaning those that have the navigation kit inside the helmet. Garmin and TomTom make navigation devices that are mounted on motorbikes. Artishchev said that his company will offer a better-quality display and will not make users look in the top right-hand corner, unlike Google Glass. Instead of spending money on creating a full prototype, LiveMap brought to the Consumer Electronics Show some key components of the proposed technology: the display and the voice control application. Some of the LiveMap staff work for Russian aircraft maker Sukhoi, which has been designing and developing displays and optical systems for pilots' helmets for the past 50 years. With grants, loans and Artishchev's own money, LiveMap has raised $1 million and is planning to raise a further $10 million, right at the conference. The goal is a challenge to Russian venture capitalists, who are more interested in supporting clones of successful projects. "If we are speaking of motivation, I want to resolve real problems rather than create social networking sites for cats and dogs," Artishchev said. He is convinced that the helmet can save motorcyclists from road accidents. The company has already signed deals with key production partners and is planning to start selling its helmets in the United States and Canada as soon as the end of 2014 for $2,000 a piece. Motohelmet is already available for pre-order.